Hikari can’t believe how peaceful his life is, post-cultural festival. 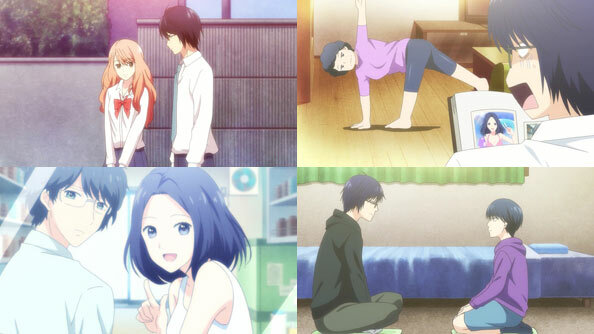 He didn’t say anything stupid to piss off Iroha, and things seem pretty five-by-five at home too, with his brother Kaoru asking for money to take Anzu on a date but promising to pay him back, while their mom has taken up yoga in an effort to get back some of her past splendor (I can relate to Hikari’s discomfort; my mom was also quite the looker in her youth, which is why I am a looker). But that peace suddenly shatters, and not due to anything on the girlfriend or school side. All this time Hikari’s family was just humming along in the background, but we barely saw his dad. Turns out, they barely saw him too. And while Hikari and Iroha are at a family restaurant they overhear a young woman telling an older man that it would be wrong to keep seeing each other. The older man turns out to be…Hikari’s Dad. Hikari keeps what he knows from his mom, but she finds out when his dad tells her, and all of a sudden his family life has become a soap opera. Hikari wants his dad to stand up for himself or at least offer some kind of defense beyond a flaccid “I’m sorry”, to no avail. 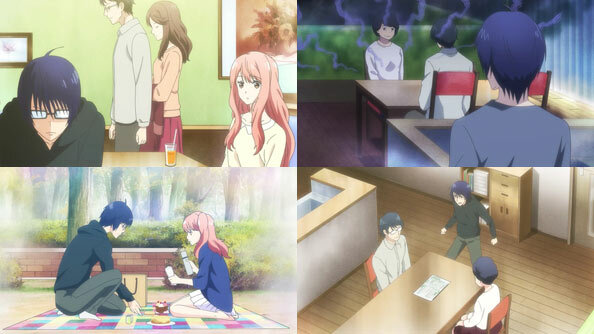 Hikari has a dessert picnic with Iroha to get out of the house, but when he returns things have escalated and divorce papers are literally on the table. If his mom divorces his dad, she’ll take one of the two kids all the way up to Hokkaido with her, which means some serious upheaval for that kid, not to mention being separated from their girlfriend. When Hikari meets with Itou, the latter is still twisted up in a knot over what went down after the festival with Ayado (she ran off after he said what he said and can’t even make eye contact with him now). But even Itou recognizes that Hikari’s also in big trouble. Hikari is cursed with a little brother who, despite still being in grade school, already possesses logic that meets or exceeds that of a full-grown adult. Hikari is honest with him that he can’t move to Hokkaido because of Iroha, but his bro has Anzu, so there’s no simple answer of which kid should go. 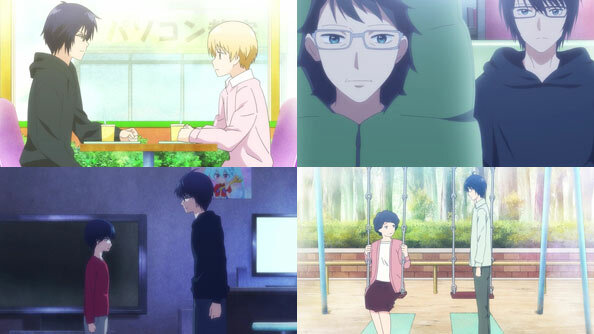 Hikari has one-on-ones with both his dad and mom, and learns that his dad still loves his mom but isn’t sure he deserves her anymore (mirroring Hikari’s own frequent feelings vis-a-vis Iroha). His pops also gets quite poetic, noting the irony of a glue researcher being unable to keep the bonds of matrimony together. But isn’t that because, like Hikari with friends, he’s just not trying hard enough? When his mom leaves a note saying she’ll be out of the house for a while, Hikari is the one to track her down, insisting she reconsider as he doesn’t want the family broken up at all. But all he seems to do is convince her that he’s the son she should take with her to Hokkaido. Unless Iroha is willing to move with him, it’s going to be the dreaded long-distance relationship. So much for peace!